Edda is a collection of deep, hypnotic tales from Germany’s Synthetic Forest. Edda features powerful subsonic frequencies coupled with spooky forest themes and driving rhythms. Be sure to bring an extra pair of undergarments, you are likely to be in the woods for days… Artwork by Ningura, mastering by Anomalistic Studios. MP3 Download | FLAC Download | WAV Download · Download count: 8,562. Very good release Sasch my friend! :) awesome cover and music! amazing work brother! thxxx for sharing! In a vicious war, a golden paradise slowly burned and dripped down the desert dunes. Helpless against unknown forces, the astronomical collective of sky scraping pyramids was buried deep underneath the hot sand as if it never existed. The violent explosions of black bubbling tar from the hellish swamp erupted over everything, staining the surfaces of their existence with a thick tar. People screamed as the fire ripped the flesh off their very bodies like bullets on a battlefield. Stretching their arms high into the smokey sky, their pleas were silenced by the almighty creatures that washed over their world. The pyramids sank deep down into the yellow abyss bellow, taking the entire tribe into its isolated grave. The once proud Grimnismals had vanished into lands unknown, leaving nothing behind but an untold legend shrouded with mystery and chaos. Years passed as the moons above turned day into night. The land below became rich with a strange alien soil. As the distant galaxies sat stagnant in the purple night sky, plastic trees and metallic fungus curiously sprouted from the ground. They towered over the sand to create mazes of unnatural phenomena, blitzing a series of exotic beings into the barren world. The synthetic forest gave birth to a multitude of abominations. Laughing, screaming, yawning, crying, and beckoning, they chatted amongst each other to plan taking over, multiplying in unsurpassable numbers to morph reality into sheer terror. Soon, there would be nothing but tangled branches, slimy entities, and darkness. Edda had come. In a progressively evil journey, a trilogy of captivating frequency developments known to us as Grímnismál, Valkyria, and Fenja evolves into a darkening terraform. This terrifying soundscape is meant for trapping willing visitors in a moment of euphoria, changing your dreamworlds into nightmares. 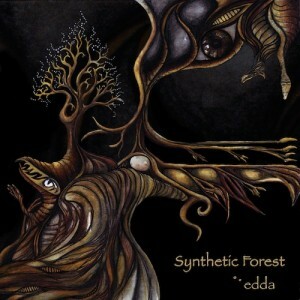 With layer after layer of twisted bass textures, electrifying synth arpeggiation, and organic overtures, Edda’s Synthetic Forest will take you into worlds unknown. Although it will be a short journey, it is certainly impactful for anyone interested in jumping into the universe of Darkspsy and Forest. Shattering realities, the hypnotizing tracks are quality, paying close attention to the mastering and interesting progression into higher levels of sound. Something tells me the artist needs to produce more than just three tracks, however. If you enjoyed it as much as I did, send him your regards so he can step behind his instruments to bring us more of his musical interactions. This is an awesome addition for any listeners darkpsy collection… but I truly wish there was more to be offered! Keep injecting the darkness into sound Edda and bring us more addictive tracks like you did here. thx man for this wonderful discription….!!!!!! !..this Ep was specially made only with 3 tracks!! !but see it as a part between…a full length album will come in 2014!!! Can you explain me how to make the awesome kick from last title?